Is the Columbus Real Estate Market Slowing? Should you sell (or buy) a home now, or wait? It’s no secret that the real estate market in Columbus has been on fire for the past few years. The average sale price of a home in central Ohio hit a record high in May. Homes are selling faster than ever. And inventory in August was 13.2 percent lower than August of 2016. All this has many people speculating about another real estate bubble. Should you sell now before the bubble bursts? Should you sit on the sidelines and wait to buy? I’m not an economist, and I don’t have some secret insight into the future. What I am about to share is my own opinion based on research. It is not intended to be, nor should it be taken as, advise about what you should do next. Please do your own research and come to your own conclusions. There. Now that I have done my best to cover my own backside, let’s get started. I’ll begin by explaining the real estate cycle. It has been a long-observed (if not commonly known) phenomenon that the real estate market in the U.S. moves in a regular cycle. The cycle goes through four stages—Recovery, Expansion, Hypersupply, and Recession—which I will outline in detail shortly. 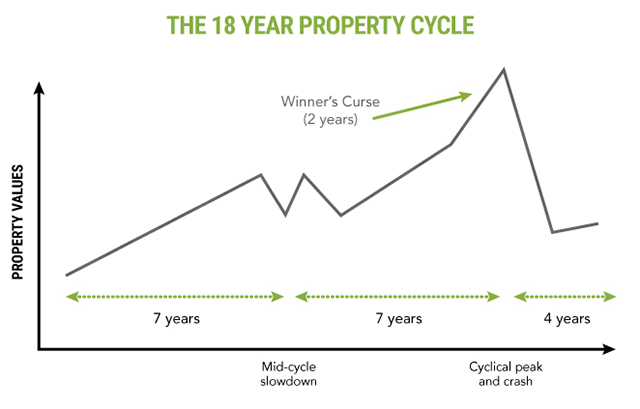 The rather amazing thing about the real estate cycle is that it is regular, consistent, and predictable. 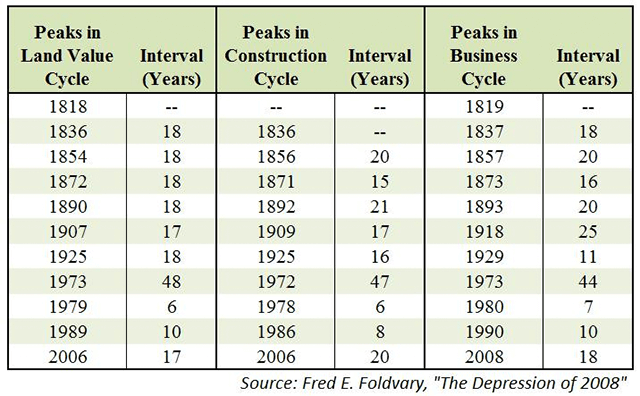 The cycle was first observed by real estate economist Homer Hoyt in the 1930s and can be traced back nearly 200 years. Hoyt found that the cycle repeated consistently every 18 years. There have been only two exceptions to the rule, both of which can be easily explained. The first is the 48 year span you see in the chart above, starting in 1925. The real estate boom that should have followed 1925 would have occurred around 1943, but that cycle was interrupted by World War II. Since there was no real estate boom during the war, there was no post-war depression, so the cycle resumed in the 1950s, ending in 1973. The second exception to the 18 year cycle immediately followed the first. High unemployment and high inflation, along with increases in tangible goods such as gold and silver, ultimately prompted the Federal Reserve to intervene in 1979. The Fed’s actions resulted in a recession in 1980, cutting the real estate cycle into two pieces—a 6 year interval and a 10 year interval. So let’s take a look at the cycle and dig into the four phases a little bit to understand how it works. First, please note that this graph shows the change in vacancy over time. The black line does not represent real estate prices (although prices follow this pretty closely) it represents vacancy—including that of residential rentals and home sales as well as commercial properties. Before Recovery starts, we are in Recession. An oversupply of housing from new construction during the last cycle coupled with a lack of demand brings the price of land to its lowest point. Recovery begins when the excess construction from the previous cycle finally stops and demand slowly starts to absorb the existing oversupply, usually as a result of increasing population. Vacancies begin to decrease as companies begin using empty buildings and individuals move into vacant housing. The transition from Recovery to Expansion happens when vacancy rates reach the long-term occupancy average. Companies and individuals have bought or rented most of the available space. As demand catches up with supply, landlords start to raise rents and sale prices increase. As rent and sales increases begin to generate new revenue and demand continues to climb, the cost of new construction eventually reaches a point where development becomes feasible. New construction, however, by necessity lags behind the increasing demand. Developers have to negotiate land purchases. They sometimes have to change zoning on their new land. They have to get permits to start development. They have to secure financing. And after all of those delays, the construction itself takes two to five years to complete for the average development. During all of this time while developers are preparing to start new construction, the Expansion has been in full swing. Demand has been increasing without the benefit of new supply for five to seven years, and occupancy rates and rents have been increasing to match the increasing demand. And as long as demand grows more than supply, vacancy rates continue to fall and Expansion will continues. The cycle eventually reaches a point at which rents/sale prices are not just going up. They are increasing at an accelerating rate. Sellers begin to build this acceleration into their sale prices, adding a premium to their current land value as they anticipate what it will be worth in the future. Developers, believing that these increased prices are justified by this anticipated future growth, begin to overpay for land and start construction for a future market. Hypersupply begins as we start to see an increase in vacancy/unsold housing inventory. This happens as the increasing supply of housing finally starts to fill the demand. Occupancy rates are still well above the long-term average (i.e., vacancy rates are very low), and rents/sale prices continue to rise. However, rents/sale prices are no longer growing at an accelerating rate. Instead, those increases are beginning to slow until prices ultimately peak during this phase. This is where the lag inherent in the housing development process that I discussed earlier now starts to take a toll. New construction continues as projects that were begun during Expansion move to completion. And so the increase in supply continues even after demand has been satisfied. The surplus supply leads to lower occupancy rates and lower rents/sale prices, which reduces revenues for developers. 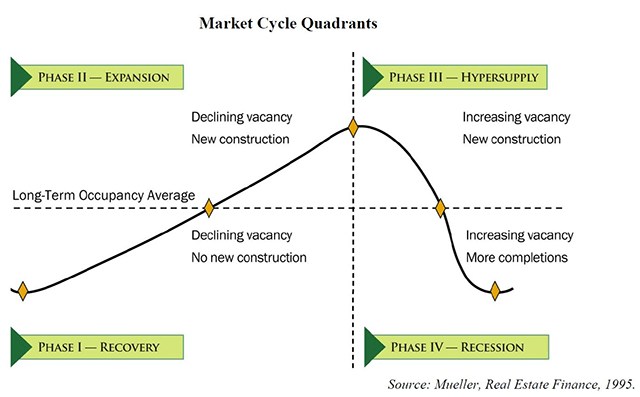 In the Recession phase we see significant oversupply combined with decreasing demand. Rents/sale prices continue to fall, and developers start to experience financial losses. Exacerbating the problem, the price increases caused by Hypersupply often require the Federal Reserve to raise interest rates in an effort to fight inflation. Higher interest rates cause potential borrowers (i.e., buyers) to leave the market, causing demand to fall even faster. As prices and demand continue to drop, developers and property owners find themselves unable to sell for a profit. Homeowners who are content to stay put (and who borrowed wisely in relation to their income when they purchased their home) will sit and ride out the Recession. However, investors and developers, as well as homeowners who overextended themselves with a home purchase, often find themselves selling at a loss—or worse, falling into foreclosure. Such was the case in 2008-09. The cycle we are currently in started in 2006, when housing was at its peak. If the cycle holds to its natural flow, we should see the next peak in prices around 2024. The following diagram shows how housing prices move through the 18 year cycle. This time the black line is not vacancy rates, it’s pricing. Confusing, I know. But I think this will be helpful. While the cycle as we just learned it started during Recovery, we can just as easily pick any point in the cycle and watch how it moves. Right now, let’s look at the peak of home prices (2006), which you will recall happened during the last Hypersupply phase. Using the chart above we can see that the time between the peak of prices to the trough is about four years. Then we have a seven year increase in prices before we hit a little bump that lasts for a year or so. Finally, we see prices rise again for roughly another seven years before reaching the next peak. What is that little bump in the middle? It’s called the mid-cycle slowdown, and it can be caused by one or more factors. Often the pent-up demand for housing during the previous recession has been met at this point in the cycle, temporarily slowing demand. However, factors outside of the housing market—like an increase in interest rates or a correction in the stock market—can also play a role in the slowdown. Now let’s do some math. Starting at the peak in 2006 and adding four years to get to the bottom of prices gets us to 2010. That’s about when we started seeing home prices increase again. Add seven more years and… uh oh. That’s 2017. We appear to be due—maybe even overdue—for a mid-cycle slowdown. And if you’re like me, you’ve heard plenty of stock market experts predicting an impending correction after hitting record highs. If our current cycle holds true to form (and we have to keep in mind that history does not require the cycle to repeat, even though we have solid evidence that it has many times), then it seems likely that a looming stock market correction would kick off a mid-course slowdown in the housing market. Prices would drop a little for a year or so and then recover before increasing to their eventual peak. So what’s the right answer? Should you sell (or buy) now, or should you wait? I have often said that your house is a strange beast. On the one hand, it’s likely your largest investment, and as such, you want it to make money for you. On the other hand, it is your home—the place where you watch your family grow, enjoy laughs with good friends, and generally make memories. When someone buys a home, they generally plan to stay there for a long period of time, which makes the “memory place” function of the home equally important as, if not more important than, its “investment vehicle” function. It is my opinion then, that the “right time” to sell or buy is determined by so many personal factors that it really doesn’t matter where we are in the market cycle. First, many of the reasons for selling or buying a house—a job transfer, a growing family, kids leaving the nest, declining health—just happen when they happen, without regard for what the market is doing at the moment. Second, when the real estate market shifts, it shifts for everyone. So if you already own a home and are planning on selling it to buy something else, it doesn’t really matter when you do it. If you sell when the market’s up, you will also be paying more for your next house. If you sell when homes are cheaper, you will save when you buy your next home. Well, there are a few cases where the cycle (and where we are in it) can help inform your decisions. 1. If you are looking to sell your home (or investment property) and don’t intend to buy another one, then now is a great time to sell. Prices have been on the rise for seven or eight years. If the stock market does experience a correction soon as most experts predict, that will likely be the cause real estate prices to decline roughly six months after the stock market starts to fall, which means that we could be nearing a short-term peak in prices in the next year or so. 2. If you are a first-time home buyer, are looking to purchase a second home, or are considering investing in real estate, expect home prices to continue to rise for a bit longer. A mid-cycle slowdown would cause prices to decline somewhat, and it seems likely that slowdown will be triggered by a correction in the stock market. That said, the price dip in housing should be short-lived (a year or so), after which I expect to see home prices climb again for a few years until we reach the peak. Over the long term (and a house purchase is almost always long term) you should still see an increase in value over today’s prices. If you’re eager to stop renting and start owning, now is still a good time to start looking. So there you go. Those are my two cents about the state of the real estate market in Columbus today. If you stuck with me this far, I’d like to thank you. I know I got a bit technical, but I hope it was helpful. As I hope is clear, I have tried to do my homework. That said, the future is never certain. Only time will tell whether history continues to repeat. It will be interesting to come back to this post in a year’s time and see how close my prognostication came to reality.